Celebrating Bolivia Independence Day - August 6th: In Bolivia each region celebrates its "foundation day" on a different date because, due to geographical and differences and the particular circumstances of the era, each region had to fight for independence from Spain on its own, little by little, and the regions gained their independence over a period of various years. That’s why each of Bolivia’s 9 departments (states) celebrates its foundation on the date of the most decisive battle fought. Thus, for example, Santa Cruz celebrates on the 24th of September, in honor of the Battle of La Florida while Tarija celebrates on the 15th of April, in honor of the Battle of the Tablada, and so on. However, the date on which the entire county celebrates Bolivia Independence Day together is August 6th. This is the date on which Bolivia was officially founded as an independent republic, so following the tradition of commemorating the most decisive battles, and even though by 1825 Bolivia had been free from Spain for quite a while, the decision was made to declare the country’s official foundation on the day of the Battle of Ayacucho, a battle won by Mariscal de Sucre, whose victory over the Spanish armed forces in the highland region definitively earned the country its independence. 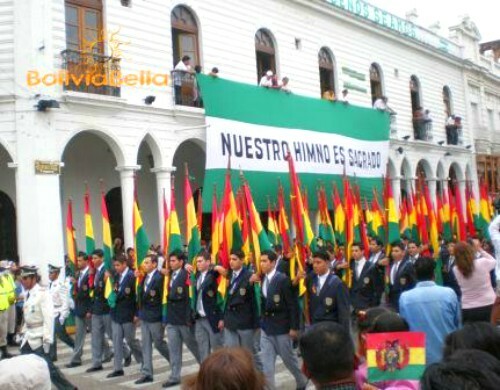 Official Bolivia Independence Day festivities have always taken place in the country's capital city of Sucre. However, for the first time ever, in 2010, official Bolivia Independence Day festivities were not celebrated in their traditional location and were moved to the country’s largest city, Santa Cruz de la Sierra. This measure, of course, was fiercely resisted by the inhabitants of Sucre who were left to celebrate on their own. This, because in 2009, President Evo Morales signed a decree declaring that as of this date festivities shall be rotated to a different city each year. Military parades and the traditional session of honor held by Congress (which is now actually called the Plurinational Legislative Assembly, and during which the president typical makes a state of the union address) will also be taken to different cities. In addition, the government attempted to impose the use of the whipala (an Andean indigenous flag that Morales has now proclaimed as a national symbol) by declaring it should be raised along with the original Bolivian national flag and the flag of Santa Cruz. The government of Santa Cruz refused to do this, despite warnings by Vice President Alvaro García Linera that the city would be obligated to do so “come what may”. In the end, and after heated negotiations, the decision was made to raise only the Bolivian national flag, and neither the whipala nor the flag of Santa Cruz. Bolivia Independence Day festivities usually include the ever-present Tedeum, a mass that generally takes place at about 9 a.m. in the Cathedral on the main plaza of each city. There are sometimes also interdenominational service, at the request of the national government, during which indigenous ceremonial rituals are performed. Depending on the location, this may be followed by a floral offering (a floral arrangement is usually placed on a stand at the foot of the central monument in each city's central plaza), after which the Bolivian national flag is raised while a military band plays the Bolivian National Anthem. Following this, authorities and invited guests take their places on a set of decorated bleachers that are in place on one side of the plaza itself from which they will watch the Bolivia Independence Day parade. During this parade school children and teachers, employees of institutions, companies and organizations of all types, and members of the various branches of the military march. This is called the "Desfile de Homenaje". In the afternoon, starting at about 3 p.m., the Plurinational Legislative Assembly (formerly known as Congress) holds its session of honor. National authorities gather and the president makes his state of the union speech. This concludes with a cocktail for invited guests while throughout the city inhabitants will continue with traditional festivities. Many people use this day to get together with friends or extended family or to travel for a day away from the city.